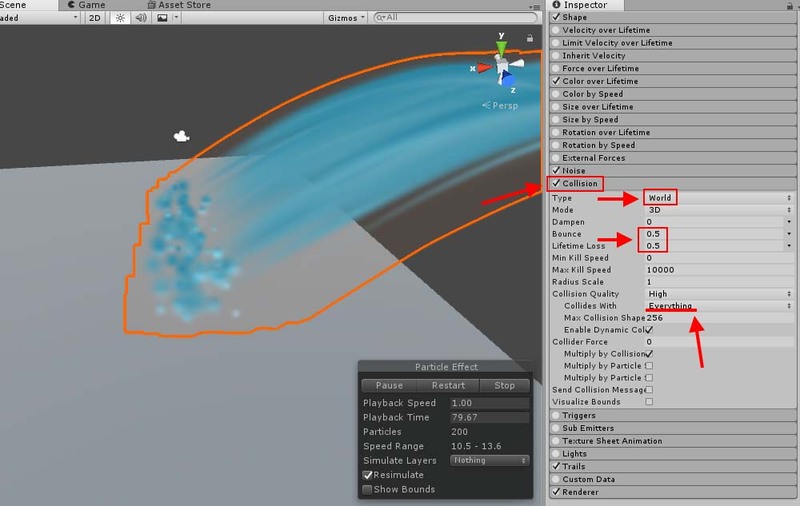 In this article, I introduce how to make a surging wave that splashes when it hit an object, by the Particle System in Unity. The completed image is shown above. 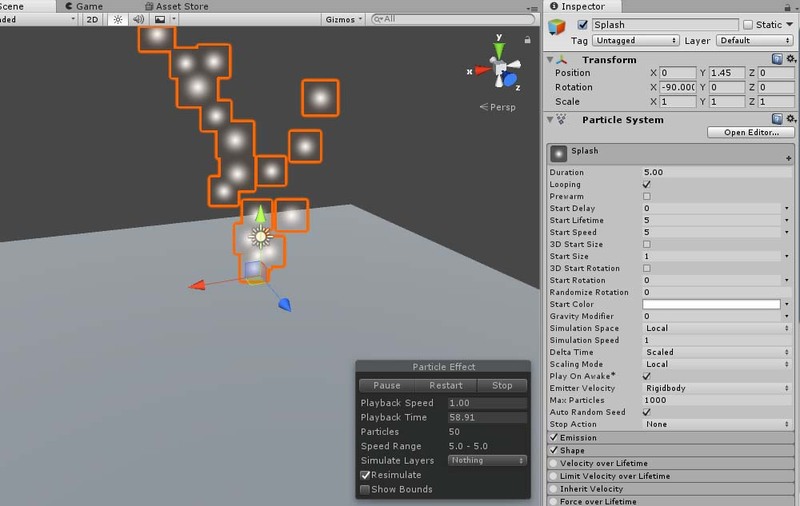 Select GameObject > Effects > Particle System. 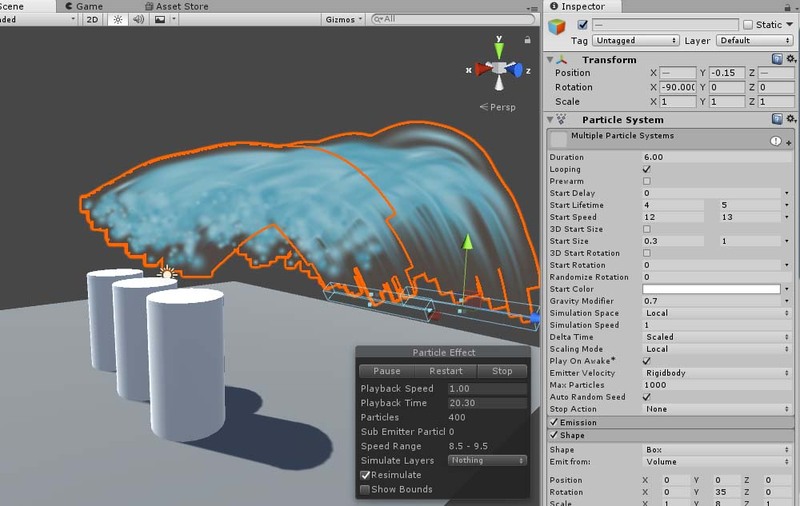 It created a Particle System. Next, check the box for the Shape module and change the shape and the direction. I set Shape to “Box”, Rotation Y to 60 and Scale to 8. Check the box for Emission module to set the parameters. Add a Burst with Count and Interval set to 200 and 4 respectively. Check the box for Trails module to add a Trail. 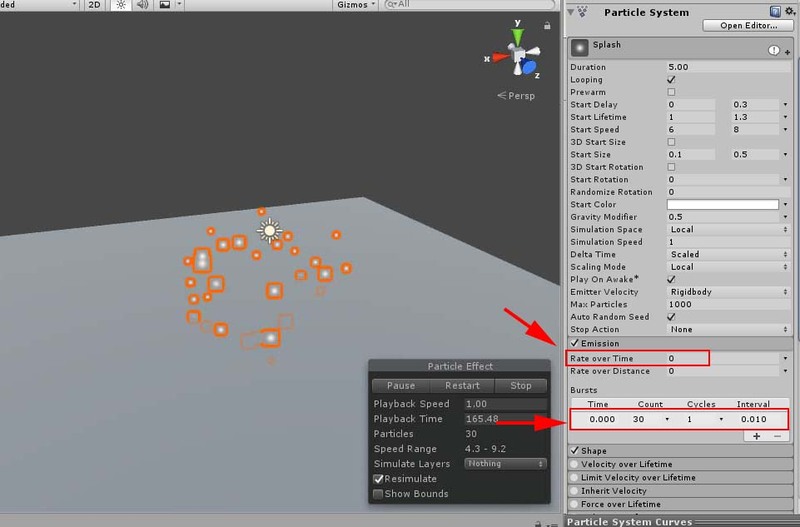 Set Trail Material to Default-Particle. It looks neater now as the material is changed. Set Lifetime and “Width over Lifetime” under the Trail section (Set ‘Random Between Two Constant” in the drop-down box for both). We now adjust the parameters for the main module. The shape and the motion are set now. Let’s colour the wave as the colour is still left white. We now set the gradation in the “Color over Lifetime” module. Set the gradation so that it starts with blue and turns white before it disappears. Add some randomness to the motion by the Noise module. Set Strength to 0.1 and 0.3 with “Random between two constants” selected. 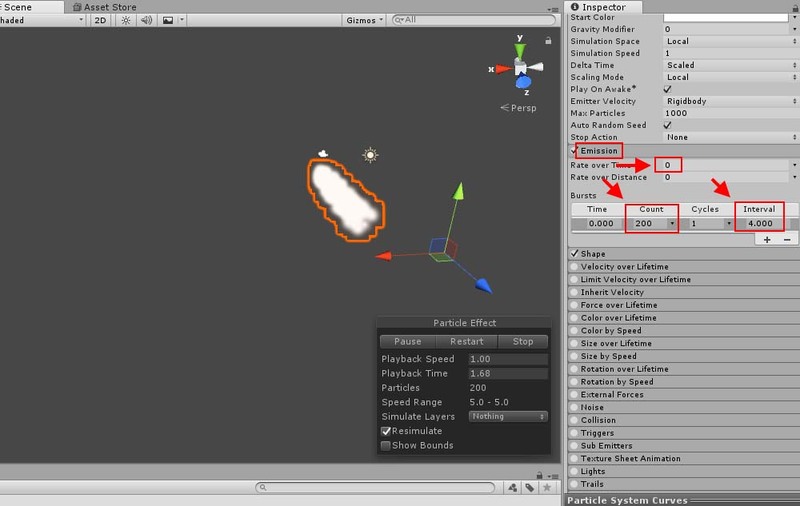 Add the Collision module to make the particles collide. 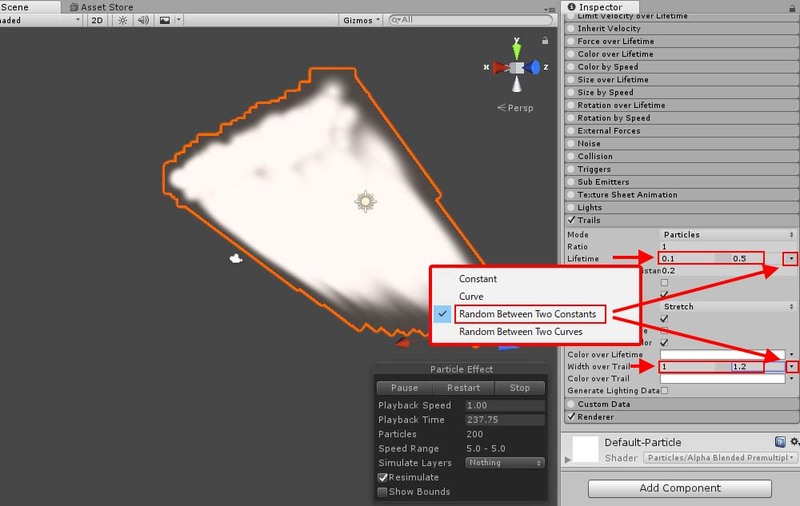 You can specify the layer of the object to collide by setting “Collides With”. Create a new layer to collide. Add a layer by “Add layer” and rename it “Hit Object”. 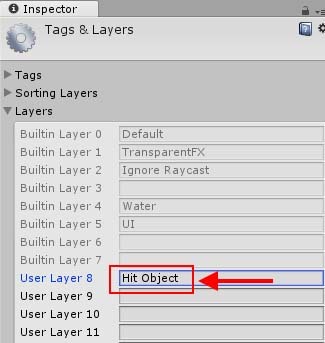 Assign the new layer, “Hit Object”, to Collides With. 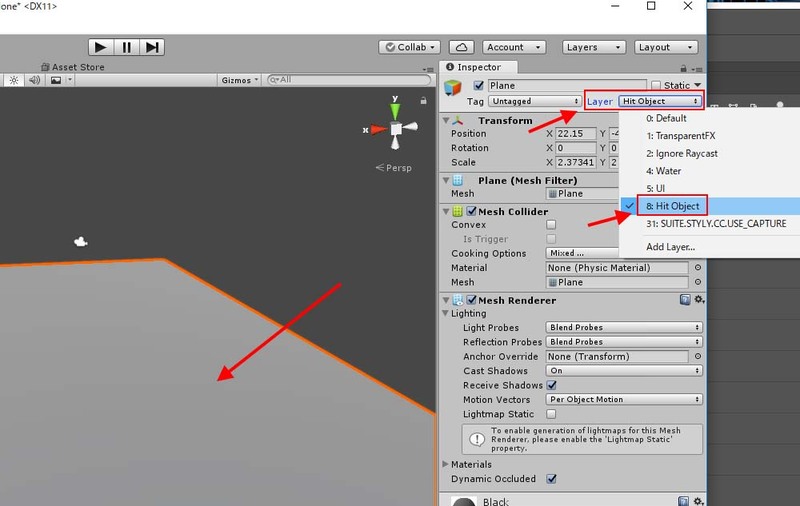 Assign the layer to collide. Now they only collide with the object in “Hit Object” layer. 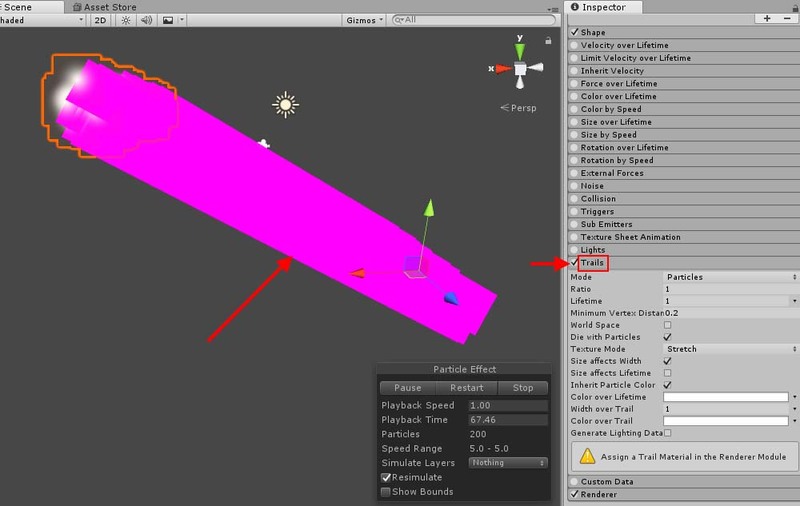 You can also make the plane collide with the particles by changing its layer from “Default” to “Hit Object”. *Please note that you can upload the Default layer only to the current version of STYLY. So leave all objects in the Default layer to upload to STYLY. Leave “Collides With” set to Everything as well. Assign the new layer to the Plane as well. 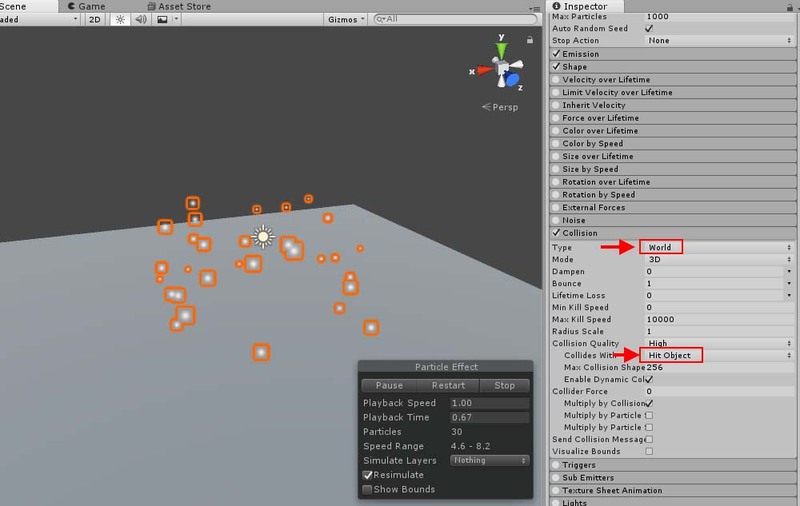 Assign all objects you want to collide with the particles to the “Collides With” layer. 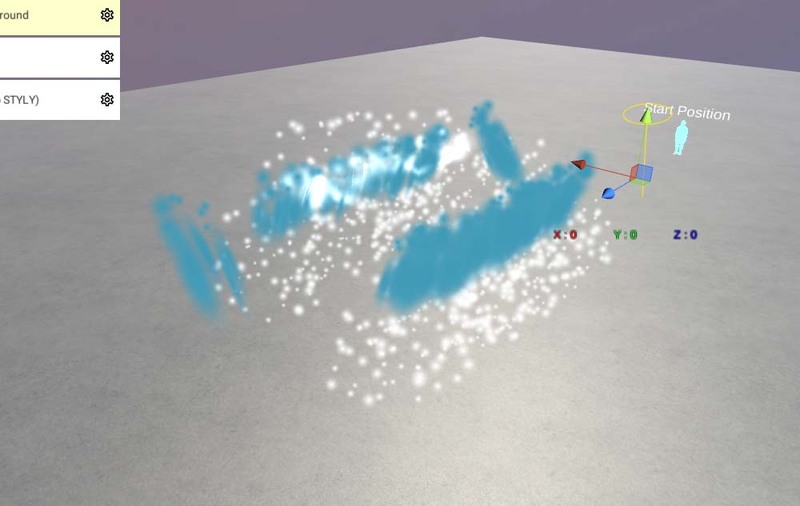 Let’s make a water-splash effect when the particles collide. 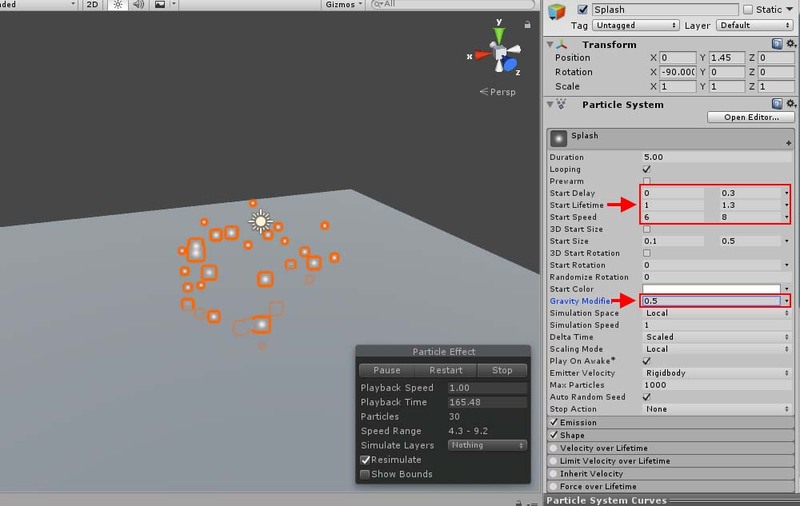 Firstly, create a Particle System. Set Shape to “Sphere” and Radius to 0.1. Set the parameters of the main module. Set “Rate over Lifetime” to zero. Add a Burst and set Time, Count and Cycle to 0, 30 and 1 respectively. 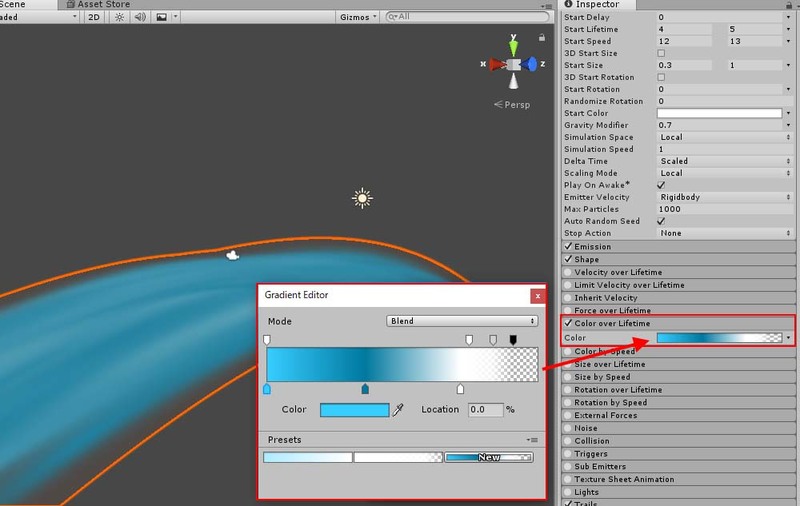 Enable the splashing water to collide as well. 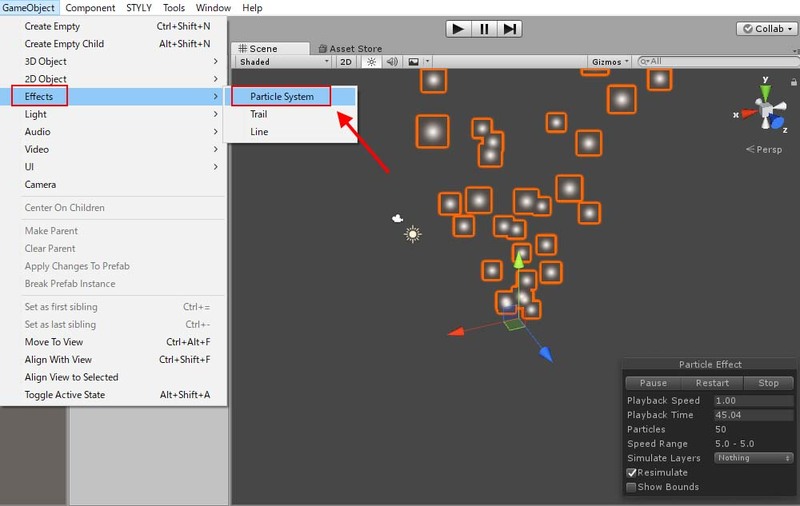 Set Type to “World” and assign the “Hit Object” layer to Collides With. Trigger the water-splashing effect when a big wave collides with the object. 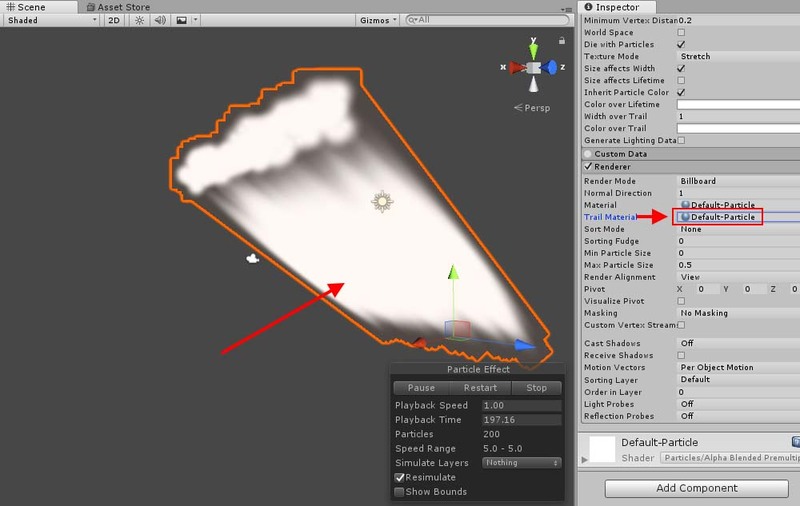 Add “Sub Emitters” to the effect of the big wave to make it happen. 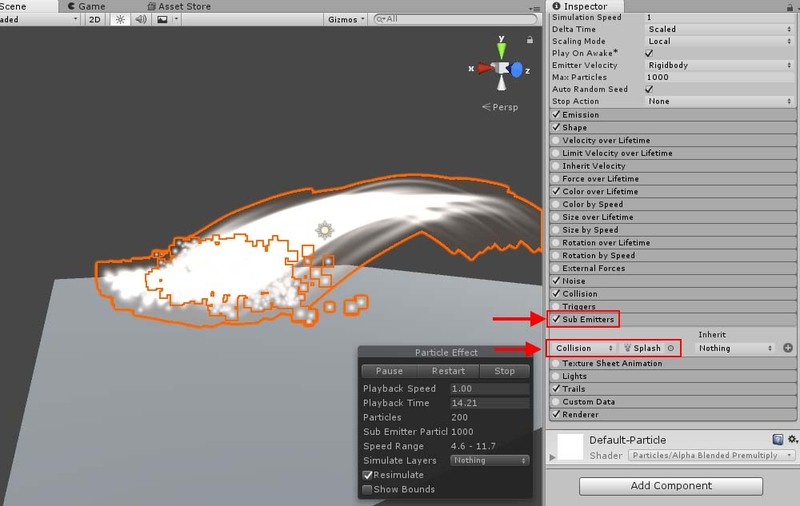 Set the trigger to “Collision” and the effect to “Splash”. Click “Yes, Reparent” when the window shown above pops up. 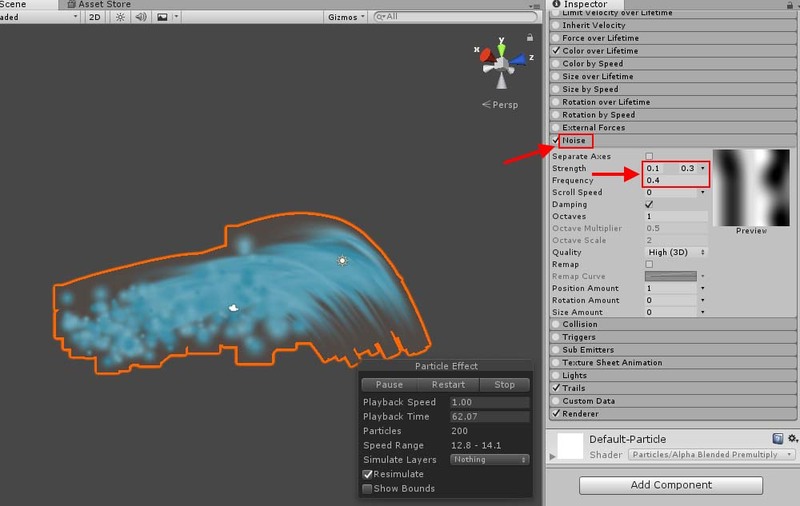 This make a water-splash effect happen when a big wave hits the objects in the “Hit Object” layer. The effect is activated when the wave collides. I assigned “Cylinder” to the “Hit Object” layer in the example shown below. 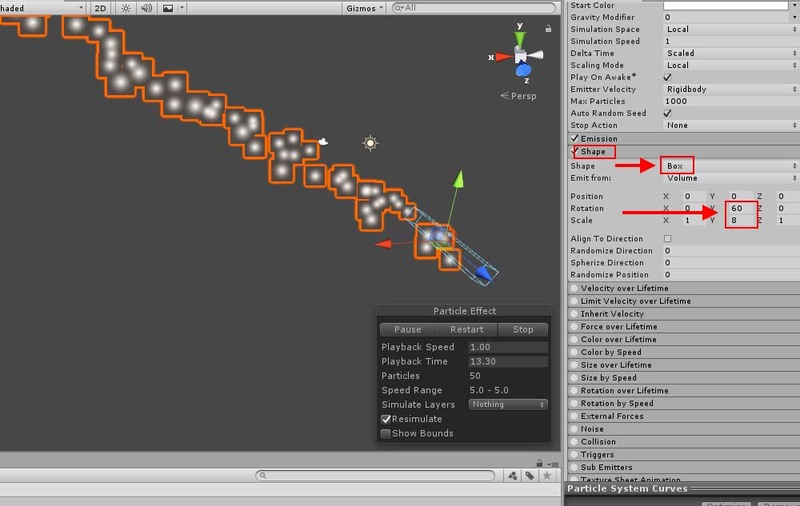 When you place the effect we made in STYLY editor, you will find the collision activated too early. 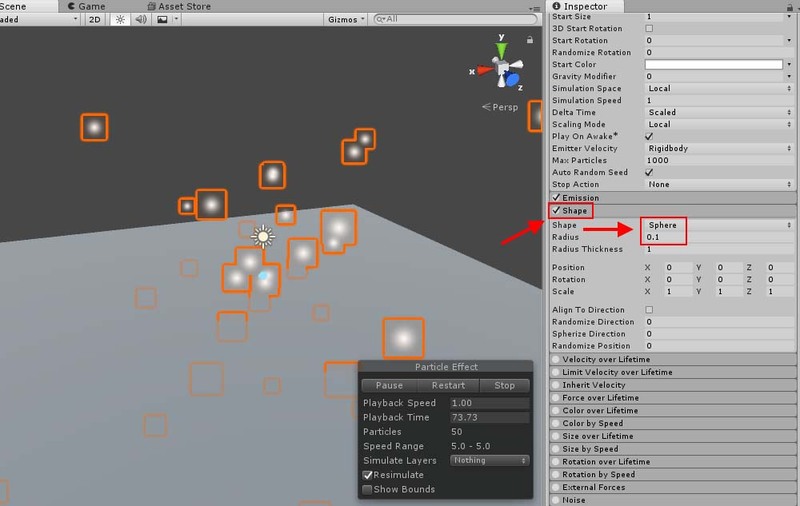 This is because STYLE Editor creates and places a BoxCollider automatically when it loads the Assets. It will be solved when you open STYLY Launcher and view it with VR goggles. 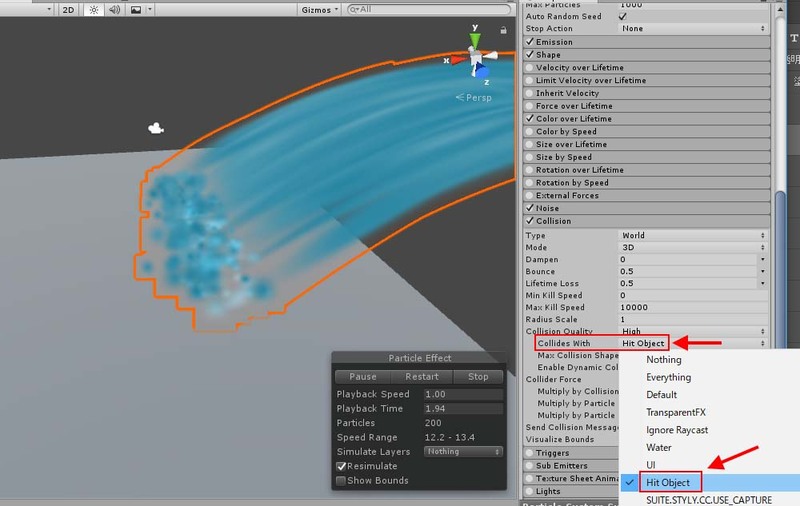 In this article, I introduced how to express a splashing wave by Particle System in Unity. 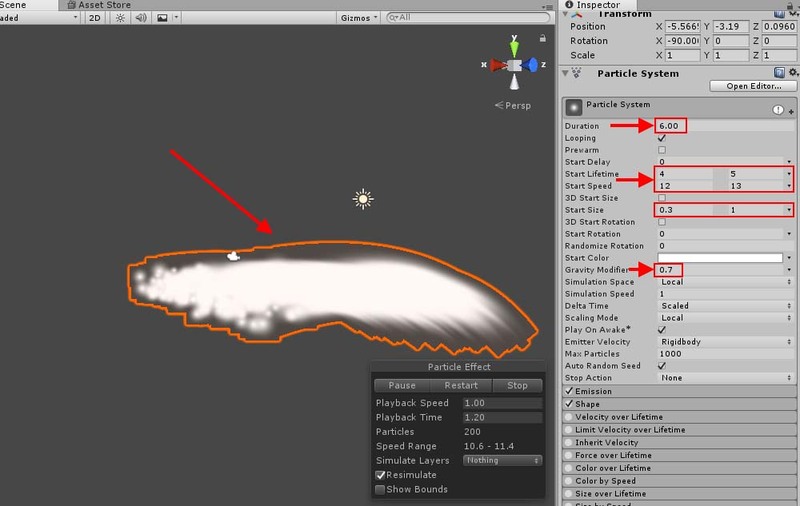 You can make the effect more realistic by making the particles collide with objects.